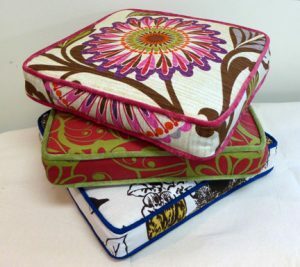 With expert tuition from Carole Barter, during this workshop you’ll learn to make piped and zipped Box Cushions. You’ll come away from this class with the skills and techniques needed to build a beautiful boxed and piped cushion! If you would like to bring your own fabric then you will need 1m (full width) of suitable fabric, contact us if you need any extra advice.